Keeping Up With The Joneses: Did You Know? May is CF Awareness Month. Did You Know? May is CF Awareness Month. I had intentions of writing this post at least a week ago, but the week hasn't gone as planned. Turns out that the timing of this will be perfect because today is the first day of May and May is CF Awareness Month. For a few months now I have been asking (begging, pleading, soliciting) all who will pay attention to donate to our Great Strides team this year. Our walk is coming up on May 17th and so far Team Bryce Bryce Baby has raised over 10,000! If you would like to donate, sign up to walk or do both please click HERE! (It's easy to do so anyone should be able to follow the steps). I wanted to share some exciting news that really wouldn't be possible without people continually donating/supporting the CFF. On April 9th I received a phone call from Vertex Pharmaceuticals. For those of you who are wondering what in the world is Vertex...they are the makers of drug Kalydeco and Kalydeco was a pretty big breakthrough in the CF community. It received FDA approval 2 years ago for certain CF patients ages 6 and up. The group of people that this drug works on have the G551D mutation (gating mutation), which is a rare mutation. Only 4% of the population has this mutation and it just so happens that our Bryce is part of that 4%! The representative on the phone was calling to tell me they had received Bryce's paper work from his care team to get things rolling for him to begin Kalydeco this summer! I was pleasantly surprised by the call because I had no idea our team was sending in the paper work. My plan was to talk to them about Kalydeco at our upcoming clinic on May 6. Our team is one step ahead of me. I seriously love them. The rep proceeded to tell me that she will contact me again in June to finish up some paperwork (financial assistance type stuff) so everything can be in place for his 6th birthday in July. The aim is to have the first shipment of Kalydeco sent out on his 6th birthday! How exciting is this?! Exciting and a bit scary since Kalydeco comes with a $300,000 price tag per year. It is one of the most expensive drugs in the US. I do not know exactly what we will be paying for this drug, but word on the street is that no one is paying more than a $50.00 copay per month between insurance and financial assistance programs that Vertex offers. I am attaching a link to an article that was written about Kalydeco and how it came to be from the very start through now. I insist you read this article. It's a long article, but completely fascinating. I won't lie, the article brought me to tears because it is absolutely amazing the journey that has led to this drug. It is a BIG deal people. It is not a cure, but it is a definite game changer as the article says. READ ARTICLE HERE. 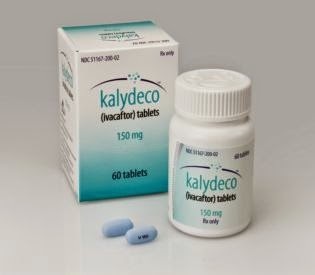 If you click on the work Kalydeco in the first sentence you can go to Kalydeco's website if you like, but read the article. It's awesome. I'm going to go ahead and thank you for reading the article and also thank you for your support of Bryce and the CF community over the past almost 6 years. Together we are all making a difference and it feels good! Bryce got his G551D mutation from Bryan. His other mutation DeltaF508 came from me, which is the most common mutation in the US (I believe around 70% of the CF population have at least one copy of this mutation). The way we learned who gave Bryce what mutation was Bryan's brother and sister both had blood panels done after we learned of Bryce's CF. BOTH of them carry the G551D gene. To break this down just a little further. Sydney and Jordyn also had blood panels done, which let us know that Jordyn is not a carrier of the CF mutated gene, but Sydney is. She is a carrier of the DeltaF508.